A collection of predictions from renowned psychics across the globe, covering world and local events, politics, entertainment, environment, spirituality, and more. Genuine and best psychics in the Philippines and worldwide! Accurate predictions of 2016 Philippine Elections, Miss Universe 2015/2016/2017/2018, Pacquiao - Bradley World Boxing match, Miss Earth 2016/2017, Miss Grand International 2016, Miss Supranational 2016, Miss World 2016/2017/2018, Hispanoamericana 2017, Bb. Pilipinas 2017/2018, Catriona Gray, Duterte and Trump administrations, and celebrities. Definitely one of the best and most accurate psychics in the world. 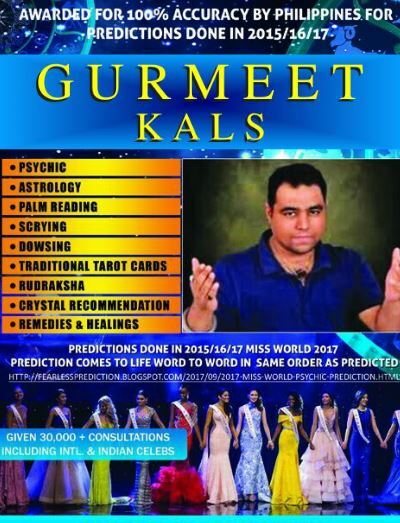 As claimed by many of his clients, "an encounter with Psychic Gurmeet is mind-boggling!" A natural clairvoyant, clairsentient, clairtangent, and clairaudient, Psychic Gurmeet became aware of his abilities at the age of 8, when, as a child he felt it more like a curse rather than a gift. He was able to pick up on other people's feelings and thoughts. One day on a land trip, the train he was riding on suddenly stopped, knocking him down -- and then he remembered travelling through a very bright white tunnel, seeing amazing gold rivers, beautiful and colorful flowers and mountains! He was already in the hospital when he regained consciousness. It was an extraordinary experience which flashes back in his mind from time to time until now. At a young age, he ventured in the Himalayas for meditation, where his healing abilities were recognized by monks. They blessed him with meditation techniques, which he still uses until now for distance healing and predictions, and an antique tarot deck and its secrets from a mysterious old woman. "I have been able to make thousands of correct predictions around the world. Showing the right path to people makes my capabilities stronger every time. It is God who heals and concludes every ones actions. Don't thank me as I'm only the medium. Instead, thank God!" "I believe in Karmic Cycle and suggest all those who come for healing to me, that I will only heal if GOD permits me to do so, otherwise I say no, if it is not his will. Anyone who asks me with a pure clean heart surely gets the right answer." All content provided on this blog is for entertainment purposes only. The owner of, and contributors to this blog make no representations as to the accuracy or completeness of any information on this site or found by following any link on this site. The owner of, and contributors to this blog will not be liable for any errors or omissions in this information nor for the availability of this information. The owner and contributors will not be liable for any losses, injuries, or damages from the display or use of this information. Psychic readings are not intended to, nor should it ever take the place of professional services including but not limited to: medical, legal, financial, business and/or psychological. This blog does not represent the views and predictions of the psychics featured herein. While the psychics maintain their respective track records in the industry, the blog owner remains impartial to their views and predictions. The role of this blog and its owner, therefore, is merely to present the predictions submitted by each psychics in a form that is understandable to the readers. The images on this blog, unless otherwise noted, are copyright to their respective owners.